The IRB has announced the panel of referees that will take the whistle for the forthcoming British and Irish Lions tour to South Africa. With neutrality in mind only five of the IRB's referee panel were eligible for Test match duty, with the tour games being supervised by a mixture of South African officials and representatives from the home unions. New Zealander Bryce Lawrence will take charge of the first Test in Durban on June 20 before France's Christophe Berdos will officiate at the second Test at Loftus Versfeld on June 27. Australian Stuart Dickinson rounds off the Test officials for the third Test in Johannesburg. Marius Jonker will take charge of the tour opener, when the Lions take on the Royal XV in Rustenberg on May 30. 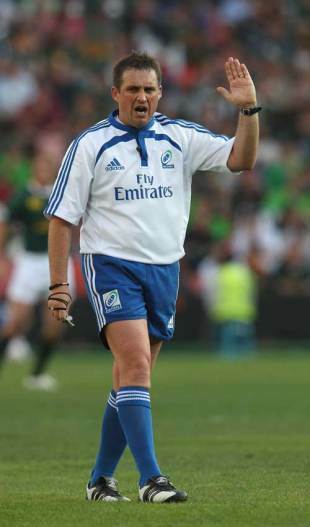 "We met with the Lions and South Africa team management last month and all were in favour of the appointment of neutral match officials for the Test series," said IRB Referee Manager Paddy O'Brien. "Bryce, Christophe and Stuart are all highly experienced members of the IRB's High Performance Referee Panel with nearly 80 internationals between them. They are relishing the opportunity to take their place in Lions history."